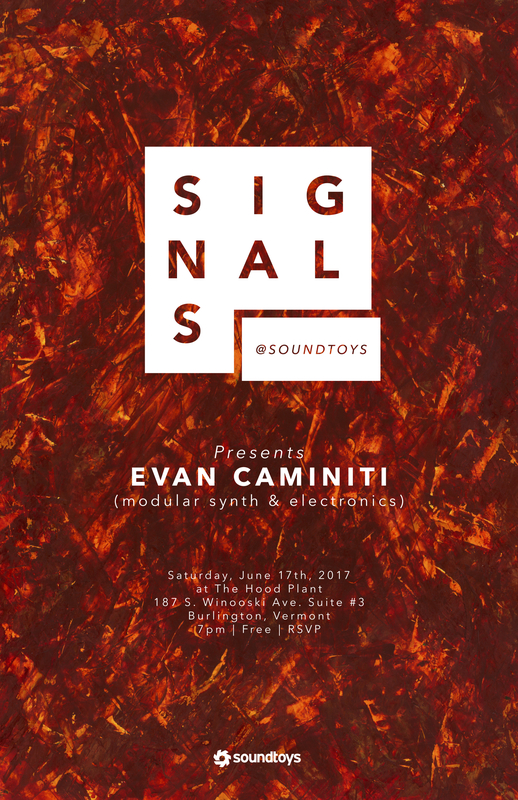 Soundtoys is proud to present SIGNALS: Evan Caminiti, on Saturday, June 17 at 7pm. This is the fifth installment of the unique experimental music & lecture series, hosted by local musician/curator Greg Davis at the Soundtoys headquarters in Burlington, Vermont. Evan Caminiti is an NYC-based musician known for his diverse palette of acoustic mediums. His most recently release, “Toxic City Music,” was inspired by the “psychic and physical toxicity of life in late capitalism.” Conceived throughout 2015 and 2016, Caminiti captured the sounds of NYC’s machinery and voices before weaving them into his studio experiments. This collection of song mutations unravels in hazy plumes and serrated edges; concrète sounds mesh with disembodied strings and corrosive electronics on “Joaquin”, drones ripple under stuttering rhythms and crude synth detritus throughout “NYC Ego”. On “Toxic Tape (Love Canal)”, layers of digital degradation smear guitar clusters, dissolving into a dubby devotional-ambient space. Evan will be bringing his modular synth rig, and the performance will be followed by a Q&A. Click here to RSVP for this free event.